Turner Sports Interactive recently announced the launch of a web site/blog for analyst TNT NBA Analyst Mike Fratello at http://mikefratello.com/ . One of the headlights of the site being emphasized by Turner is video from the "Czar of the Telestrator." But his telestrator videos are not embedded in the site. Instead, there is a screen shot that redirects to the NBA web site. Is it possible that, even though Turner produces NBA.com, they suffer the same fate as every other ordinary blogger in the free world: video from certain league owned sites cannot be embedded in the site? So here is a simple question. Is the purpose of the new web site to provide the wisdom and insight of Mike Fratello or to artificially increase traffic to the NBA video web site? It is probably both, but the same thing could be done, and the same end result achieved by embedding the video, followed by a link saying "Click here to see more Fratello videos." Doing this would make the user experience more fluid and give a better indicator of how many people are being sent to the NBA.com video site because they want to, not because they had to to see the video. Here is the full press release issued by Turner last week. 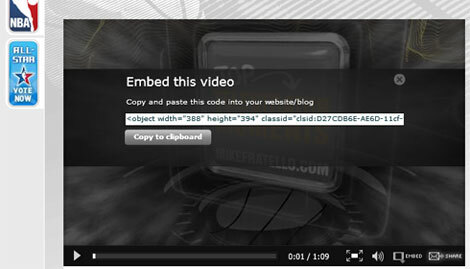 * Fratello Fundamentals – Mike puts on his coaching hat to explain basketball strategies. * Mike’s Fantasy Pick – The Czar gives his expert advice on which player is in store for a big fantasy week. * Question of the Week – Mike answers some of the bigger questions surrounding the NBA. * From the Booth – The Czar shares what he and fellow broadcasters are up to in front of the camera and behind the scenes. * Czar’s Week in Review – Mike analyzes the previous week of NBA action. * Weekly Polls – Mike asks a new poll question every week and allows fans to answer. 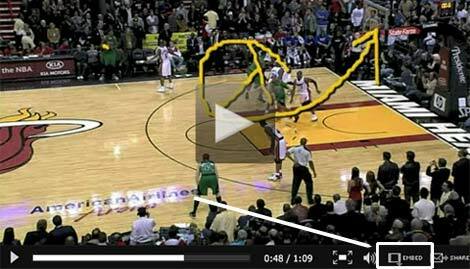 * Top Telestrator Moments – Mike breaks down NBA footage in a way only the “Czar of the Telestrator” can. * Stories From an NBA Coach – Mike recounts episodes from his NBA coaching career spanning over two decades. * Fired Up – Mike voices his opinion on issues around the league. MikeFratello.com is part of the Turner Sports and Entertainment Digital Network. Turner Sports, a division of Turner Broadcasting System, Inc., presents some of the best and most popular sporting events worldwide and is a leader in televised and online sports programming. With events airing on TBS and TNT, Turner Sports’ line-up includes NASCAR and NASCAR.COM, the NBA, Major League Baseball, professional golf, PGATOUR.COM and PGA.com. Turner Sports and the NBA also jointly manage NBA Digital, which includes NBA TV, NBA.com, NBA League Pass, NBADLeague.com and WNBA.com.